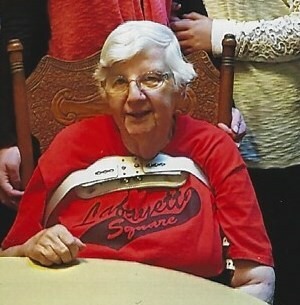 B. Alice Bishop, 85, of Macomb went to be with her Lord and Savior at 2:30 a.m. Saturday, February 2, 2019 at the Elms Nusring Home in Macomb. She was born in Warren County, Illinois on November 5, 1933 to Herman T. and Icie E. Smith Bishop. She resided in Blandinsville and Macomb during her lifetime. For almost 30 years she resided at Lafayette Square where she was a house-sitter and President of the resident association. Alice also worked at Clugston’s, Bridgeway, Hardees and was a housekeeper for 33 years. Alice was a strong Christian woman and everyone who knew her witnessed her faith. She was a member of the First Baptist Church in Macomb. She served as a deacon, on the fellowship committee, Past President of Women’s Society and a member of Area II Board and Salem Association Trustee and Past President of the Church Women United. Alice is survived by her nephew Gene (Kris) Frakes of Macomb, her niece Nava (Rick) Combs of rural Avon, three great-nieces Brittany, Elizabeth and Amanda, three great-nephews Justin, Zachary and Zur, three great-great- nieces Mya, Hailey and Zaylee and Cadence due in March and four great-great nephews Zylur, Dakin, River and Nathan. She was preceded in death by her brothers James H. Bishop and and E. Kenneth Bishop and one in infancy, sister E. Irene Frakes Harding and one in infancy, two nephews Robert Frakes and James Bishop who were killed in Vietnam and a great-great-nephew Lakota Lester in infancy. Family and friends were very important to Alice. Her heart was big and many experienced her love. She will be missed beyond words. Funeral services will be held at 10:30 a.m. Wednesday, February 6, 2019 at Clugston-Tibbitts Funeral Home in Macomb with Pastor Claudia McCain officiating. Visitation will be held from 9:30 to 10:30 a.m. Wednesday at the funeral home. Burial will be in Argyle Cemetery north of Colchester. Memorials may be made to the First Baptist Church or Lafayette Square Inc.
Clugston-Tibbitts Funeral Home in Macomb is in charge of arrangement.